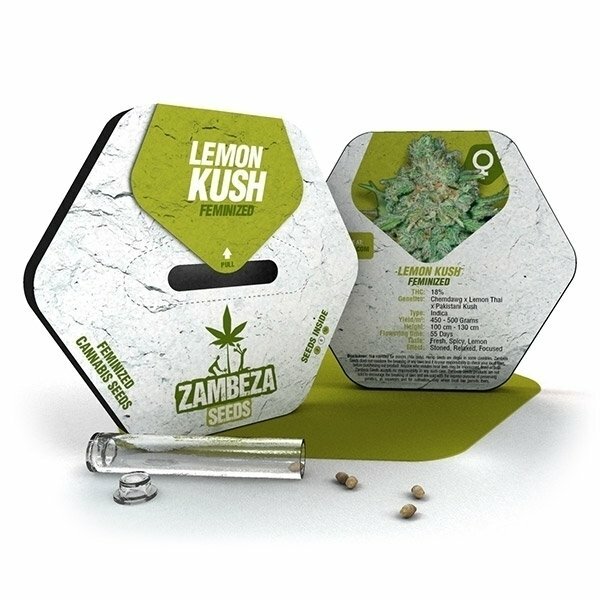 Lemon Kush is one of the ultimate Kush strains available today. It is famed the world over for its intense and complex effects and strong flavor. Many Hollywood celebrities, rappers, die-hard potheads and medical users admit it is their favorite weed. Lemon Kush requires roughly 8 weeks to develop its large and dense, lime green and very resinous buds and delivers about 65 grams per plant. Lemon Kush is one of the ultimate Kush varieties on the market today. It is famed and renowned the world over for its complex and strong effects and the intense taste. Many Hollywood celebrities, rappers, medical users and die-hard potheads admitted it is their favorite strain and reported that the potency is hard to beat. The effects of Lemon Kush on the body are as strong as they are on the cerebral activity. The genetics of Lemon Kush is dominated by Indica influences, but the initial sensation after a few tokes definitely shows her Sativa side. The heady effect is quickly followed by a strong relaxation and body-numbing feeling. The plants rarely exceed a height of 70-100cm, making Lemon Kush the perfect candidate for growers with limited space and for guerrilla plantations. The large, dense, lime green and very resinous buds are ready for reaping after around 8 weeks of flowering, yielding about 65 grams per plant. Both the aroma and flavor of the weed is intense, slightly citrusy, almost like a strong detergent or fuel.